Former Wales and Cardiff City striker Nathan Blake is among those shocked by reports that Malky Mackay and Iain Moody are alleged to have shared racist, sexist and homophobic texts. 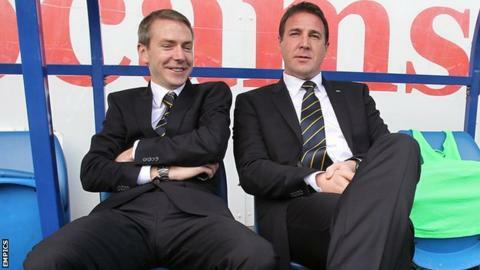 Ex-Cardiff boss Mackay has apologised for sending two text messages he admits were "disrespectful of other cultures". "I'm very surprised and very disappointed," Blake said. "The most worrying element for me is the age of the two who are said to be at the centre of the allegations." Blake continued: "A manager and a sporting director hold these kind of beliefs and feelings... it is really concerning because they hold the key to a lot of young players' futures and prospects." A statement issued on Thursday by the League Managers' Association (LMA) on Mackay's behalf said that the texts were "two isolated matters... out of over 10,000 text messages and 70,000 documents" and were part of "friendly text message banter". On Friday, after widespread criticism from anti-discrimination campaigners over its statement, the LMA had apologised. BBC Wales understands that Cardiff City were extremely disappointed with the original LMA statement, believing it downplayed highly offensive comments, while Blake says that in his view any such exchanges are unacceptable. "Go on, fat Phil. Nothing like a Jew that sees money slipping through his fingers." On football agent Phil Smith. "He's a snake, a gay snake. Not to be trusted." Referring to an official at another club. "Not many white faces amongst that lot but worth considering." Referring to a list of potential signings. "There's no place for it... I would prefer a man to just stand up and say 'yeah I did it, I apologise, I am that way in my beliefs' and then we all know exactly where we stand," added the 42-year-old, who won 29 caps for Wales. Mackay and Moody, the former head of player recruitment at Cardiff, were sacked by the Welsh club last season and the Bluebirds have sent a dossier to the Football Association alleging misconduct. Moody was appointed Crystal Palace's sporting director but resigned on Thursday after the text accusations, while Mackay had been thought to be favourite but is now not in contention for the vacant manager's job at Selhurst Park. Another former Wales striker, Iwan Roberts - a close associate of Mackay and a BBC pundit - says he does not believe the 42-year-old Scotsman meant any offence. "Malky made Steven Caulker captain at Cardiff, took the captaincy from Mark Hudson... he brought Kim [Bo-Kyung] to Cardiff," said Roberts, 46, who played 15 times for Wales. "They're not signs of someone who's a racist, who's got these thoughts within him. "He's been silly... there's no room for it in football and society and even one text is too many. "But to pull someone from pillar to post and for Malky never to work again because he's made a mistake in a private conversation, I think that's a bit harsh." May 2010: Malaysian multi-millionaire Vincent Tan joins the Cardiff City board as chairman. June 2011: Dave Jones is sacked as manager, with Malky Mackay appointed as replacement. May 2012: Tan controversially changes Cardiff's kit colour from blue to red, and replaces the bluebird emblem with a dragon. April 2013: Mackay guides Cardiff to promotion to the Premier League as champions, amassing 87 points from 46 games. Oct 2013: Head of player recruitment Iain Moody is suspended by Cardiff for an alleged overspend of £15m on transfers the previous summer. Oct 2013: Mackay and Tan hold a five-hour meeting amid rumours their relationship is becoming increasingly strained after Moody's departure. Nov 2013: Moody appointed sporting director at Crystal Palace. Dec 2013: Mackay is sacked by Cardiff City following a 3-0 defeat against Southampton. Cardiff are 16th in the Premier League, one point above the relegation zone. Jan 2014: Ole Gunnar Solskjaer is appointed Cardiff manager on a 12-month rolling contract. April 2014: Cardiff complain to the Premier League following claims that team news was leaked to Crystal Palace ahead of their meeting. May 2014: Cardiff's relegation is confirmed after a 3-0 defeat by Newcastle. May 2014: Mackay and Moody apologise to Vincent Tan over the issues that led to their dismissals. Aug 2014: Cardiff make allegations of misconduct to the FA, and are asked to provide evidence. Aug 2014: With Mackay the frontrunner to take the Crystal Palace job, allegations of misconduct during his time at Cardiff are leaked. Palace withdraw their interest in Mackay. Moody resigns.